That was a strong response form the bulls in the cash session yesterday as they clawed their way back above SPX 2700. However, S&P Futures have again sunk below 2700, it will be up to the bears to put some more oomph into the selling or else the bulls can spring back with a green daily candle. Does an Earnings Recession Lie Ahead? Despite today's stumbles, it has still been a roaring start to the year for U.S. stocks: The Dow Jones Industrial Average and S&P 500 are each up almost 8% since Dec. 31, while the Nasdaq Composite is up closer to 10%. But the way that 2019 earnings estimates have been going – down – it might be a front-loaded year. Barron's' cover storythis past weekend laid out how to invest in such an environment, ominously referred to as an "earnings recession." More than 73% of S&P 500 companies have reported fourth-quarter results. Of those, 60% beat forecasts for earnings per share, 53% beat on sales, and 37% edged estimates on both. 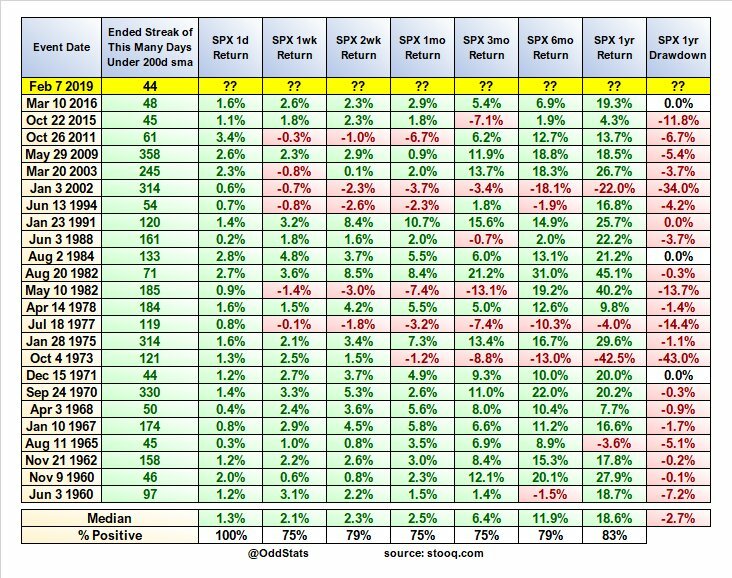 Those beat rates are about average since 2000, but they are the lowest levels at this point of an earnings season in four years. And that's on a lower bar: Consensus 2019 earnings estimates for the S&P 500 now call for 5% growth, versus 7% as recently as the beginning of January. 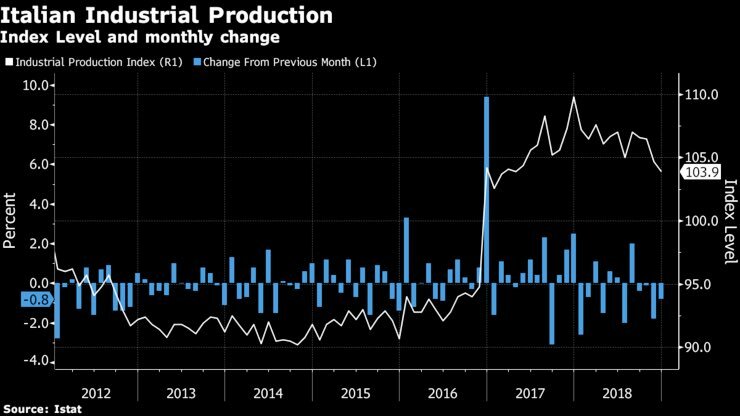 Factors driving the downward revisions include slowing global economic growth expectations, a strong U.S. dollar, and gloomy forecasts from China – a factor cited by about 10% of S&P 500 companies on their fourth-quarter conference calls. If there is a bright side to this, it is that Wall Street appears to be in a forgiving mood. Companies that beat forecasts are seeing their stocks rise by an average of 2.5% the next day, the biggest bump since the third quarter of 2015, Hall and Subramanian write. Earnings misses, meanwhile, are being punished by a relatively minor 1.3% the next day. 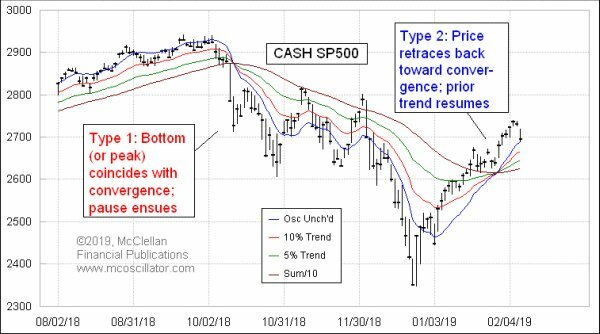 In the industrials, tech, and discretionary sectors, companies that missed estimates actually outperformed the following day. That may be a sign that investors figure things could have been a lot worse. One way to play all this: Stick with sectors that have the highest proportions of companies beating estimates. Industrials and health care had the most widespread beats on both profits and sales in the fourth quarter, according to Hall and Subramanian. The S&P 500 health care sector has gained just 4.7% this year. But industrials are outperforming, up 14.1%. 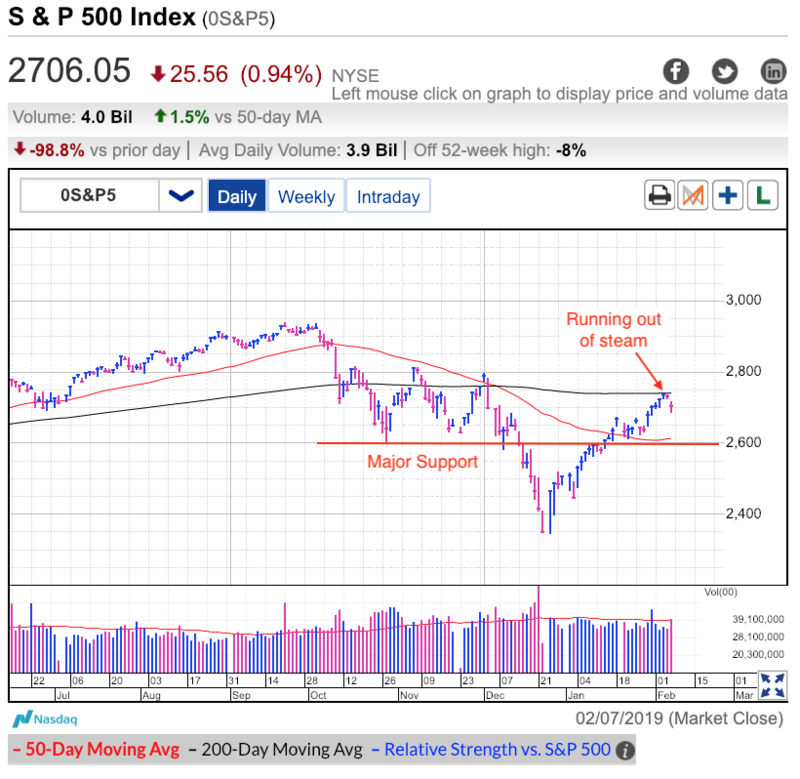 For more on why the era of big earnings beats may be coming to an end and how investors should prepare, check out Daren's report. Oil refiner Phillips 66, tire maker Goodyear Tire & Rubber, toy company Hasbro, and nuclear power giant Exelon all report earnings tomorrow morning. It's another quiet day on the U.S. economic data front tomorrow. Elsewhere, Canada's employment report for January is out and the Bank of Russia releases a policy statement. "The nice thing about today’s dip is we found a bottom before lunchtime and closed well off the early lows. That is the opposite of last year’s dreadful price-action when early weakness triggered runaway selloffs. At least for the time being, investors appear more inclined to buy the dips than pile on the selling. But it takes more than one day to consolidate nearly 400-points of gains, so we have a long way to go before we can waive the all-clear flag. I want to make one thing clear, I am most definitely not bearish and think the setup over the medium- and long-term looks good. But I am far less optimistic over the near-term. Markets move in waves and the Christmas rebound priced in a lot of good news. Hope that things will be less bad than feared. Unfortunately, the problem with hope is it leaves the door open to disappointment. The crowd is always filled with emotions that swing between extremes. Last month’s collapse was built on fear of an economic collapse. This rebound started with hope that things were not as bad as feared and quickly morphed into fear of being left behind. And no doubt recent gains leave us vulnerable to another near-term reversal. Two steps forward, one step back. That’s the way the market always worked and there is no reason to expect something different to happen here. I’m not predicting a crash or anything dramatic like that. Just a cooling off. Maybe that means some sideways trade. Maybe that means a dip back to support. Either way, it is very predictable and shouldn’t catch anyone off guard. But it will. Because it always does. Everyone knows markets move in waves, but they always forget that fact in the moment. Every dip is seen as the start of something bigger. By rule, it has to. If it didn’t scare people out, then no one would sell and we wouldn’t dip. Even if this is the start of a very normal and routine pullback to support, expect to hear all kinds of people shouting doom-and-gloom and how we better get out now before it is too late. Smart money buys discounts and sells premiums. It is definitely premature to call a one day dip a discount and we should be prepared for more. But as long as we know it’s coming, then it is a lot easier to maintain our composure and resist the urge to join the hysterical crowd. The market is acting well and there is nothing to do with our favorite long-term investments. But for our short-term swing-trades. This is a good time to get defensive and start taking profits if you haven’t already." 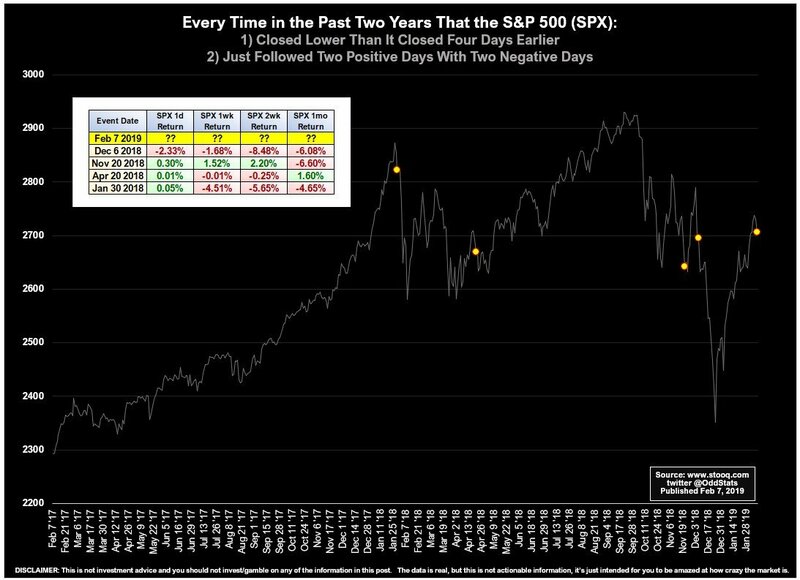 $SPX just completed a four day stretch where: 1) 2 positive days were followed by 2 negative days 2) The overall return of the four days was negative Here are the only 5 events in the past 2 years like this. All 4 prior events saw $SPX close even lower within 2 more days. Follower @Prometheus_Cap was wondering about long stretches for $SPX under its own 200d moving average. So here are the 25 most recent streaks of at least 44 days (where we are currently). MUST CLARIFY: we are still under the 200d sma. The streak did not end today. CHINA & EUROPE are weakening but US economy is still fairly strong. Bund rally continues. 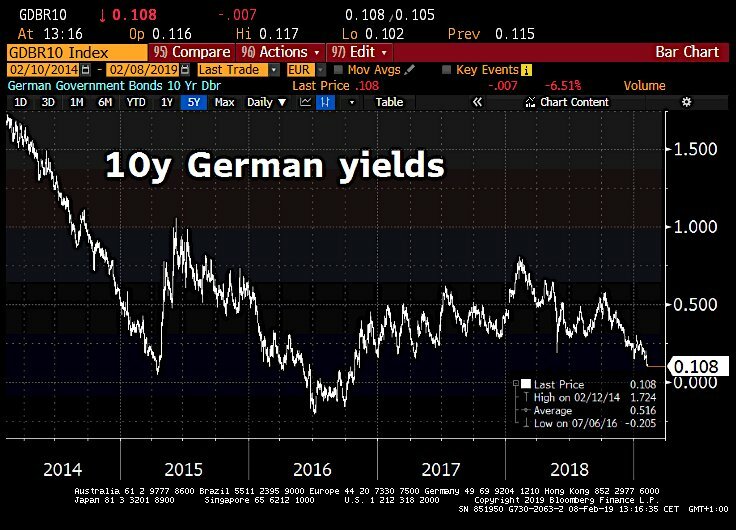 10y German yields heading towards 0%. Now 0.108%, lowest level since 2016. 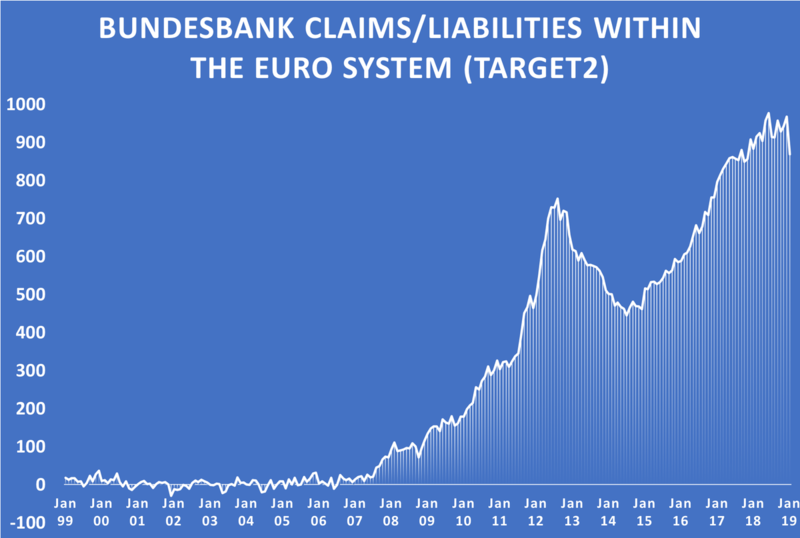 #Germany's Target2 claims have dropped by €98bn to €868bn in Jan, biggest monthly drop ever following a pause in #ECB's QE. BUT #Italy's Target2 liabilities almost unchg at €482bn. EU Commission slashes EU projected growth rate yesterday. Now this. The eurozone’s waning fortunes reflect a drastic turn of events from just two years ago. We are not immune from what happens in Europe. The Eurozone is largest economic block.